Listed below are Black History Month events in the Twin Cities and beyond. If you know of an event that we missed, let us know in the comment section. You’re invited to listen to lively stories from African and African American folktales, learn lessons for tricksters, join in with call and response, and take home little bits of wisdom. The Black Storytellers Alliance is a collaborator of this event funded by Minnesota’s Arts and Cultural Heritage Fund. Admission is free. For more info go here or call 612-543-5669. 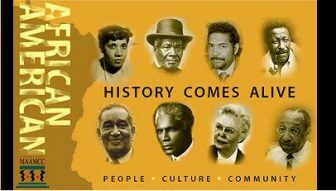 11:30 am-1 pm, “Minnesota Black History 101: A celebration of Black life, history and culture in Minnesota” Brown Bag event, Hennepin County Government Center, A-level, 300 South Sixth Street, Mpls. Through this never before assembled display of artifacts, photos, and narratives, the Minnesota Black History 101 exhibit offers a unique glimpse into the lives of some of Minnesota’s pioneering African Americans. The exhibition and corresponding events are sponsored by the Hennepin County Library in collaboration with the Minnesota African American Museum as part of their “History Comes Alive” series. The free exhibit runs until March 28. Hours are Monday through Friday, 7:30 am to 6 pm. For more info, call 612-348-3848. Discover works of art from African American artists who are widely collected by museums and art auction collectors. Obsidian Arts is a collaborator of this event funded by Minnesota’s Arts and Cultural Heritage Fund. Admission is free. For more info, call 612-543-5669. Based on the Newberry-Award winning novel by Mildred D. Taylor, Roll of Thunder, Hear My Cry tells the story of a young girl growing up in 1933 Mississippi and discovering that the world was not what she expected. The play runs from Feb. 9 to March 3, with a “pay as you’re able” performance on Feb. 11 at 3 pm. For ticket and show info, go here or call 651-225-9265. 7-9 pm, 1967: The Plymouth Avenue Rebellion Opening Reception, New Rules – Shared Workspace & Event Venue, 2015 Lowry Ave. N., Mpls. Enjoy the opening night of the African American Interpretive Center of Minnesota’s exhibition that explores through photo/audio-visuals the unrest that occurred on July 19-21, 1967 on Minneapolis’ North Side. Light refreshments will be provided. The exhibition runs until May 9. The event is free but registration is required. 2-3 pm, Author Talk: Davu Seru, Minneapolis Central Library, 300 Nicollet Mall, Mpls. 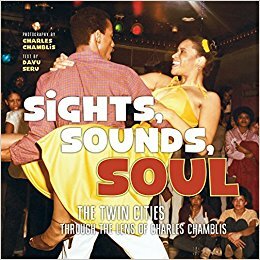 Contemporary writer, artist, and Minneapolis native Seru will discuss his latest book, Sights, Sounds, Soul: The Twin Cities Through the Lens of Charles Chamblis. During the 1970s and ’80s, photographer Chamblis captured the vibrant social and artistic life of the Twin Cities African American community. Admission is free. For more info, call 612-543-5669. Local jazz singer Thomasina Petrus will present a musical bio performance of some of America’s first and finest female jazz vocalists including Billie Holiday, Lena Horne, Ella Fitzgerald and Etta James. Petrus will channel these jazz greats of the past celebrating their talent and strength while honoring their struggle and determination. This event is funded by Minnesota’s Arts and Cultural Heritage Fund. Admission is free. For more info, call 612-543-5669. 3 pm, The Lost Negroes of North America with filmmaker Ralph L. Crowder III, Hosmer Library, 347 E. 36th St. Mpls. Independent media journalist/filmmaker Ralph L. Crowder III will share an examination of northern Black family and community life with rare video footage captured circa 1945-1955 in South Minneapolis. The community’s dialogue will assist in the shaping of the final film project The Lost Negroes of North America. This free event was funded by Minnesota’s Arts and Cultural Heritage Fund. For more info, call 612-543-5669. 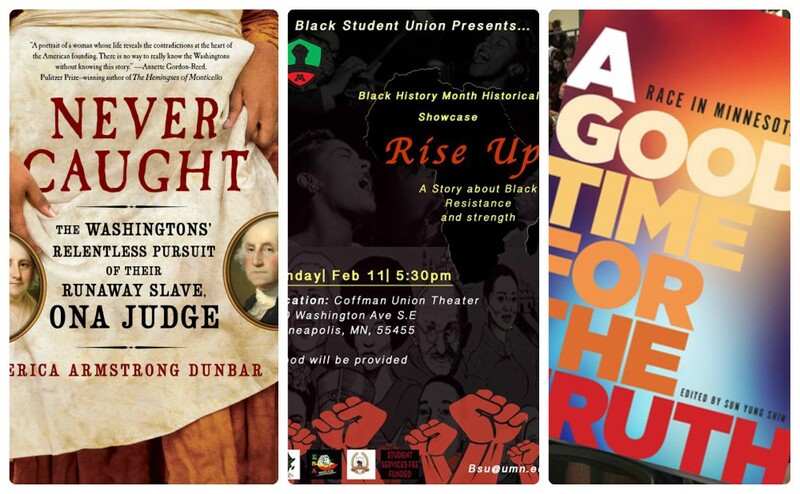 5:30-9 pm, Black History Month Showcase, Coffman Memorial Union, 300 Washington Ave. S.E., Mpls. 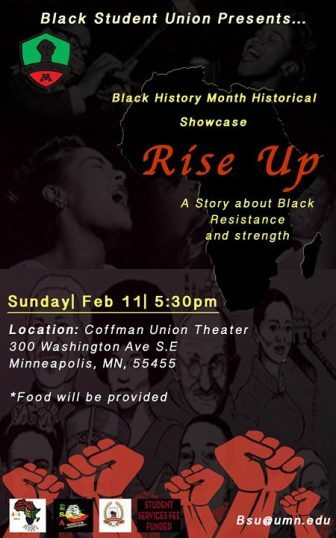 Come celebrate the richness and diversity of Black culture and history through various creative performances at the Black Student Union’s event “RISE UP — A Story about Black Resistance and Strength.” The purpose of this event is to showcase and reflect on the experiences and history of Black people all around the world. Performances by: Imani Waters, Kenya Womack, Andrea Paygar, ASAP, Velma Gesimba and many more! Food will be provided. For more info, go here. NAAPID is a national call to action for parents, particularly of African American descent, to come to their child’s school to foster an open dialogue among teachers, parents, and students. For more info about St. Paul Public Schools, call 651-767-8181 or email brandi.cavalletti@spps.org. For info about Minneapolis Public Schools, call 612-668-0000. After visiting your child’s school, celebrate the day with them at the Roller Garden. The event is free for MPS families and is sponsored by the Minneapolis Public Schools and Black Male Achievement. Students must be accompanied by a parent or guardian. For more info, call 612-290-9553. Planting People, Growing Justice will host a book fair that celebrates Black authors and their work. Also, enjoy a reading of the upcoming book, Making a Difference: the Story of Miss Freedom Fighter Esquire. For more info, go here. 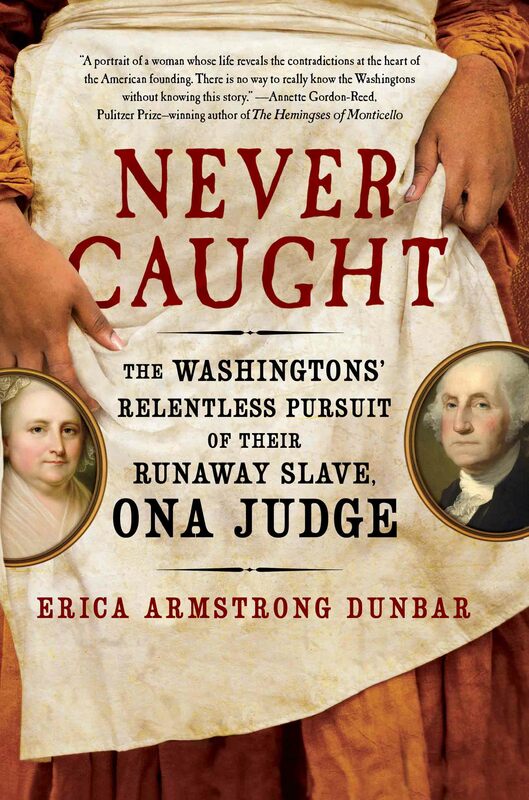 In honor of Black History Month, the Bloomington Human Rights Commission presents Erica Armstrong Dunbar, author of Never Caught: The Washingtons’ Relentless Pursuit of Their Runaway Slave, Ona Judge. Come hear the only detailed account of Ona Judge, an 18th-century fugitive, as Dunbar tells it in her book. This free presentation is made possible by the Bloomington Human Rights Commission and is co-sponsored by the Bloomington Historical Society and the Bloomington Hennepin County libraries. For more info, contact the Bloomington Human Rights Commission at 952-563-8733 or send an email to humanrights@BloomingtonMN.gov. To register for the event, go here. Explore race relations in the Twin Cities today with three of the contributors to the MNHS Press book, A Good Time for the Truth. David Lawrence Grant, Shannon Gibney, and Taiyon Coleman will talk about their experiences in a panel presentation, followed by a discussion about everyday activism and what Minnesotans can do to address it in their lives and communities. Before the panel discussion, guests can meet with community organizations who address issues of race in the Twin Cities. This program is appropriate for middle school students and up. This is a free event. For more info, go here or call 651-259-3015. 2727 E. Lake St., Mpls. Take a look at the art practices and lives of professional African American artists who lived and/or worked in Minnesota since the middle of the 19th century. Obsidian Arts is a collaborator of this event funded by Minnesota’s Arts and Cultural Heritage Fund. Admission is free. For more info, call 612-543-5669. View the documentary Tell Them We Are Rising: The Story of Historically Black Colleges and Universities and explore 150 years of the history of Black colleges and universities in America, which have educated the architects of freedom movements and cultivated leaders in every field. Doors open at 6 pm. This series is a partnership between TPT and MNHS. The program is appropriate for high school students and up. For more info, go here. This is a free event. 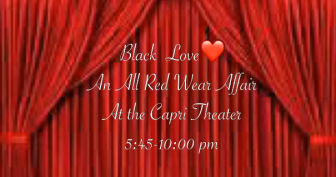 6-10 pm, Black Love, Capri Theater, 2027 W. Broadway Ave., Mpls. This celebration aims to recognize and celebrate African American history with food, fashion, and fun. The food will be rooted in African American history (soul food) cooked with today’s healthier alternatives, with fashion provided by local artists in apparel and/or makeup. The fun will be provided by the community coming together to remember the past, reflect on the present, and celebrate the future. Admission is $15-25. For more info, go here. 5:30-8:30 pm, Black History Month Evening of the Arts Soiree, Minneapolis Institute of Arts, 2400 3rd Ave. S., Mpls. The Fourth Annual Twin Cities Black History Month Networking Soirée offers an evening of sophistication featuring African and African American art, culture, and networking. The event will feature a keynote talk from the nationally acclaimed actor, T Mychael Rambo, as well as free tours of the museum’s Black art collections, and much more. Appetizers will be provided, and alcoholic beverages will be available for purchase. Dress to impress! This event is free but registration is suggested. Osseo Senior High will open its doors to the community for Osseo Speaks: A Black History Month Showcase, a student-driven event that honors the historic contributions of the past, while fostering a better present and shining optimism on our future. The event is free and open to all students, families and community members. For more info, email zehnr@district279.org. Part of the Hamline Church Music and Arts Series, this concert aims to inspire and celebrate the African American Gospel tradition. 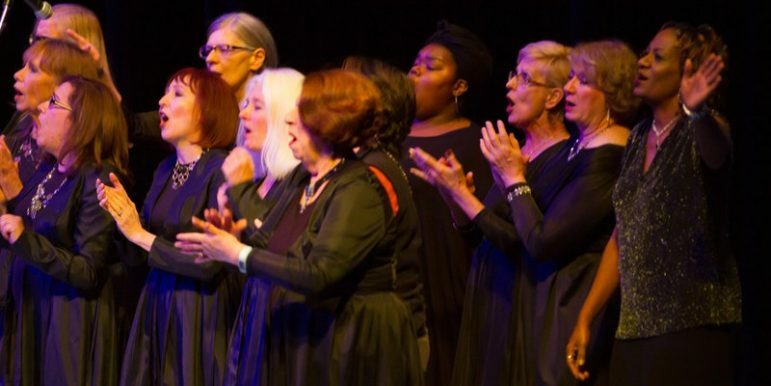 The Twin Cities Community Gospel Choir will be joined by guest artists, the Hamline University Gospel Choir and the Concordia College Gospel Choir. Tickets are $12-15. For more info, go here. 11 am, History Comes Alive: Emily O. Goodridge Grey, Nokomis Library, 5100 S. 34th Ave., Mpls. African American history comes alive in this series of interactive dramatic reenactments featuring the story of Emily O. Goodridge Grey, an African American social activist, pioneer and abolitionist in Minnesota during the 19th century. Admission is free. For more info, call 612-543-5669. 11 am — 1 pm, Presentation: Celebrating Minnesota’s African American Photographers and Artists, Minneapolis Central Library, 300 Nicollet Mall, Mpls. Presenters include Olivia Crutchfield, Bruce Palaggi, Gilbert Baldwin and Dr. Charles Crutchfield III. The George Scott Trio will provide entertainment, and refreshment will be served sponsored by The Pollination Project Foundation. For more info, visit www.minnesotasblackcommunityproject.org or call Anthony R. Scott at 612-578-0171. 11 am — 1:30 pm, Unapologetic: Black History Month Brunch, Minneapolis Urban League, 2100 Plymouth Ave. N., Mpls. This year, Minneapolis Urban League’s annual Black History Month event aims to celebrate the unapologetic advocate for equity in each of us. Keynote speaker Andrea Jenkins will reflect on her own activism, historic election to Minneapolis City Council and more. The event is free to attend, but registration is required. 4 pm, Lady Days, Sumner Library, 611 Van White Memorial Blvd., Mpls. 4 pm, Concert: VocalEssence Witness: Of Such I Dream, Orchestra Hall, 1111 Nicollet Ave., Mpls. This production pays tribute to the Harlem Renaissance, on the 100th anniversary of its birth, through song, poetry, hip-hop, dance, and more. Enjoy the VocalEssence Youth Choir as well as the world premiere of William Banfield’s chamber symphony, I Trust Harlem is Still There, based on the letters of Langston Hughes. Tickets are $10-40. A pre-concert conversation takes place from 3-3:30 pm. For more info, go here. 4-8 pm, Positive Image 6th Annual Father Daughter Dance, Earle Brown Heritage Center, 6155 Earle Brown Dr., Mpls. The 6th Annual Father Daughter Dance is a community-sponsored, formal and fun-filled evening for girls ages five years and over and the special fathers and father figures in their lives. The event focuses on the importance of fathers and their daughters having strong and healthy relationships. For more info, go here. 7-10 pm, BLACKapella 2k18: The Blackout, 2303 Kennedy St. N.E., Mpls. The 3rd Annual BLACKapella presented by #SWAGG celebrates Black creativity, joy and struggle through lyricism presented acapella from artists of different genres in unique and intimate spaces. Dress code is all black. Tickets are $10 in advance and $15 at the door. Go here for more info. In the 1950s, 1960s, and 1970s, Minneapolis resident Walter R. Scott produced a series of books about African American life in the Twin Cities. Join Scott’s children as they discuss the impact and legacy of this “pictorial résumé of the Black community, its achievements, and its goals.” Admission is free. For more info, go here or call Anthony R. Scott at 612-578-0171. 11 am-2 pm, Minneapolis Professional and Technology Diversity Career Fair, U.S. Bank Stadium Station, 401 Chicago Ave., West Plaza Lobby, Mpls. Polish up your résumé, bring plenty of copies, and come meet face-to-face with hiring managers at the Minneapolis Professional and Technology Diversity Career Fair. Admission is free. To register go here. 55 Broadway St. N.E., Mpls. Discover the work of African American artists found in museums in Minnesota and learn the importance of the artwork in terms of the artists’ shared cultural legacy. Obsidian Arts is a collaborator of this event, which was funded by Minnesota’s Arts and Cultural Heritage Fund. Admission is free. For more info, call 612-543-5669. 7:30 pm, A Raisin in the Sun, Park Square Theatre, Historic Hamm Building, 20 West 7th Place, St., Mpls. Local theater veteran Warren C. Bowles directs Lorraine Hansberry’s groundbreaking play about the dreams and trials of the Younger family. The production runs from Feb. 22 to March 16. Go here for ticket and show info. 6-9 pm, NABA Third Annual Black History Month Celebration, New Century Theatre, 900 Hennepin Ave., Mpls. Billed as a cozy and casual social evening to celebrate African American achievements in business, arts and social causes, this two-part event features spoken word and musical performances from 6-7:15 pm, and ‘Movie for Reel’ featuring a short Black film highlighting the Black experience in America and the hopes and aspirations of the community from 7:15-9 pm. $10. For more info, go here. African American history comes alive in this series of interactive dramatic reenactments featuring the story of Emily O. Goodridge Grey, an African American social activist, pioneer and abolitionist in Minnesota during the 19th century. For more info, call 612-543-5669. 11 am — 1 pm, The Scott Collection Publication Celebration, Minneapolis Central Library, 300 Nicollet Mall, Mpls. 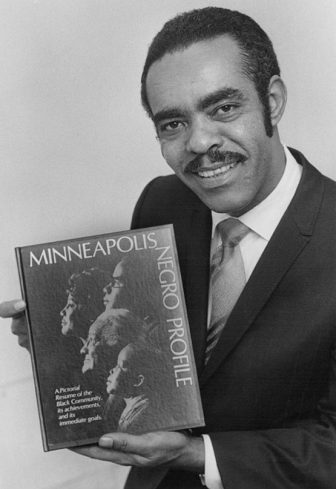 Minneapolis author and publisher Walter Scott wrote several books in the 1960s and ’70s profiling hundreds of community and professional leaders in Minneapolis’ and Minnesota’s Black community. Join Scott’s children as they discuss the impact and legacy. Entertainment and refreshments will be provided. Admission is free. For more info, go here or call Anthony R. Scott at 612-578-0171. Holy Trinity Episcopal Church, the Twin Cities’ only majority African American Episcopalian church, has joined with and led several community partners to create a series of community engagement forums dealing with racial, ethnic, and cultural understanding and reconciliation to build compassionate and respectful connections among diverse neighbors. This event is free but space is limited. Get your free ticket by going here. The Council for Minnesotans of African Heritage (CMAH), formerly the Council for Black Minnesotans is hosting its annual Day on the Hill. The event includes a rally in the Capitol Rotunda and a discussion with lawmakers about the future of the African Heritage community and the State of Minnesota. For more info, go here. Find more events or add your event to our online calendar here.